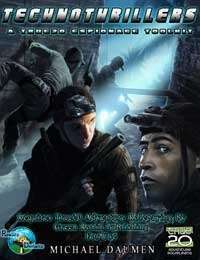 Written by Michael Daumen and Patrick Smith, Technothrillers is a 106 page True20 espionage kit which provides Narrators and Players with everything they need to run exciting, action-packed spy games! This toolkit includes new rules for using various types of Tradecraft, planning out a mission, vehicle chase rules and TONS of equipment! Technothrillers; A true20 espionage Toolkit is fully bookmarked and has a clickable table of contents. Check out this great espionage supplement for the True20 system today. This entry was posted on Friday, January 18th, 2008 at 17:21 and is filed under Uncategorized. You can follow any responses to this entry through the RSS 2.0 feed. You can leave a response, or trackback from your own site.